The surprising story of how The Beatles helped turn Nike into a multibillion-dollar company . Beatles Radio: The Beatles, Solos, Covers, Birthdays, News The Fab 4 and More! Fifty years ago the Beatles released a single that sold over 8 million copies — their highest selling 45rpm — "Hey Jude." 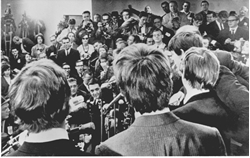 While "Hey Jude" made the greater impression, it was the B-side — "Revolution" — in which John Lennon addressed the global political upheaval of 1968 that has the more interesting story. Rare as it was for a pop song to address politics, the message in "Revolution" attracted fierce resentment within the radical left before re-appearing in 1987 in one of the most seminal and ground breaking advertisements ever made. Lennon wrote "Revolution" in India where the Beatles were meditating with the Maharishi while the Vietnam War and Chinese Cultural Revolution raged on. There was a major riot in London and Paris was brought to the brink of another revolution in May of that year.